- U-G-L-Y. The Brewers and Suppan got absolutely mauled by the Cubs. Suppan didn't even make it through four innings. His ERA went from the mid-3s to over 5. - Turnbow is just BRUTALLY awful now. He couldn't give the team an inning in a game that he came into down eight. He gave up six earned runs, four hits and four walks in just 2/3 of an inning. What a freaking headcase... I really thought that save last week could spring him to some success, but it's been the exact opposite. What can the team do with him now? Haudricourt suggests he's very close to an outright release, meaning the Brewers would eat the rest of his contract, which goes through next year. - The Cubs' catcher, Soto, had six RBI. - Gallardo will try to right the ship against the Cubs and Zambrano. - Sheets felt fine today after starting yesterday's game. More HERE. - Cameron's suspension was not an easy one for him. Two things strike me about this ESPN article. One - Cameron is a mature guy and will be a leader in the clubhouse. Two - Why would a MLB player ever buy "energy powder" over the Internet? I can't believe he would be that careless with what he puts in his body... He also mentioned that he did not receive an exemption from MLB for use of a supplement for post-concussion symptoms. He's not taking any medications, he says. More HERE. - The NL Central may be more competitive than people thought before the season. - The Brewers are still working on building on experience. - Miller Park ranked second in SI.com's MLB Ballpark Rankings. It finished first in food and promotions. I've been saying for years that Milwaukee fans don't appreciate how nice of a ballpark Miller is, but since these rankings are based on hometown fan polling, I guess I'm wrong. Wrigley finished 15th. I would like to argue their #8 ranking in fan IQ... More HERE and HERE and Jim Powell's take HERE. - Bush pitched well in AAA today as part of a veteran-stocked Sounds rotation. - The Journal-Sentinel has another mailbag. - Baseball Digest Daily asks "What if Mike Cameron and Jordan Schafer really didn't take any illegal substances?" - Jim Powell has a new podcast. - The Cubs signed a Korean high school shortstop. They are very high on him apparently,with one scout comparing him to Jeter at the same age, but better. - The Cubs may be interested in trading for Ken Griffey Jr. Please, no. As a 20-something who grew up as Griffey became a superstar, I like him. I don't want to ever see him in a Cubs' uniform. - Umpire Jerry Crawford, who left last night's game and stayed in a hospital overnight, left the hospital today. Apparently, he had a bad reaction to medicine. Hopefully he is OK. He has had several health issues over the years. - Former Brewer Chad Moeller cleared waivers and is back on the Yankees. - In football news, former Badger QB Tyler Donovan will be competing with what I can only assume is Tyler's cousin, Jason Maas, for the starting QB job in Edmonton. - The Brewers offense came alive in the win over the Cubs tonight. Every starter besides Sheets had at least one hit. They collected 17 altogether, their best night of the year. - The Brewers are 3-1 against the Cubs so far this season, all at Wrigley. Not a bad start against the current frontrunners. - Mike Cameron made his Brewer debut and fits nicely in the number two spot. I'll take a 3-5, 2 RBI, 2 run night any day. Cameron could be a valuable bat, defensive upgrade and veteran presence for this team. I'm excited to have him. More HERE and HERE and HERE. - Corey Hart was a home run away from the cycle. He's hitting a quiet .299 this season. I say quiet because he only has one HR and 11 RBI. - Sheets was shaky. He walked a career high seven runners. He could not find his location at all. He did still make it through five innings with three earned runs though. Hopefully he just needed a warm-up outing and will be back to Benny in five days. - Gagne recorded his eighth save and is tied for the league lead again. He looked solid despite giving up a hit and walking a runner. I think he threw two or three more strikes to Fontenot than were called. - Tonight's game was delayed briefly due to a strange umpire illness. Home-plate umpire Jerry Crawford left the game after the second inning to go to the hospital. Hopefully he is OK.
- The Brewers have played in a record-tying eight extra-inning games in April. - Even Yost is now admitting he's lost confidence in Turnbow. The Brewers are having a hard time figuring out when to use him. You can't in a close game until he shows some kind of consistency and he can't really go multiple innings in a blowout. More HERE. - Alcides Escobar is good. The slick-fielding SS prospect started skipping school when he was 9 to work on his fielding. I'm looking forward to watching him play in Brewer blue in a year or two. - Josh Butler, the pitcher the Brewers received in the Gross trade, had to switch dugouts shortly before he was scheduled to start a game in A-ball. The Vero Beach pitcher was traded before his start as he was set to against the Brevard County Manatees. This story details how unusual it must have been for him. - Wrigley Field is a dumpy old stadium that is falling apart and smells like stale urine. - Men could get a free prostate exam and get two free Brewers tickets at the game on Tuesday. Odd... But likely effective. - Cubs' outfielder Fukudome is on the cover of Sports Illustrated. How do you say jinx in Japanese? - The Brewers play the division-leading Cubs tomorrow and get Mike Cameron and Ben Sheets back. It is a big day and could provide some momentum. - The New York Times did a piece on Fielder being a vegetarian. It's decent in that it gives a glimpse into Prince's personality, but again, can we move on from the vegetarian subject? Apparently not, a Journal-Sentinel blogger responded to the article. - The Padres are opening a facility in the Dominican Republic and Corey Brock, the author of this article, says the Brewers are "the only team without a facility in the Dominican Republic." Brock should check his facts. The Brewers opened a facility in the Dominican this offseason. - Al from Al's Ramblings answers questions for Goat Riders of the Apocalypse. - Mailbags from the Journal-Sentinel and Brewers.com. - The clutch hitting was non-existent on the last home stand. - The Brewers appear to be better defensively than last season. - Weeks is hitting .226/.354/.453 in Brewers' wins and .162/.295/.216 in Brewers' losses. - The Brewers are 16th in the Sporting News Power Rankings. The Cubs are third. Hopefully the Brewers can change that this series. - The Crew Cast, Episode Four. - In the same vein as the Gallardo breakdown yesterday, are Hardball Times breakdowns on Mat Gamel, Prince Fielder, and Matt LaPorta. - There is not much of a push to get the DH abolished or to get it added to the NL. I agree 100 percent with Joe Torre's take on the subject: "I just wish they'd make it the same in both leagues, whatever it is. I think it's a better game without the DH. There are more decisions to make, it's more of a chess game, there's more for you to write about, more for the fans to have opinions about. Strategy-wise, it takes on more significance without the DH." I recently saw a quote from you over the weekend that sounded a little bitter towards the fans of Milwaukee for booing you. I also believe you said you weren't sure why you were booed in Milwaukee. First, I'll tell you that you are the only Brewer, and former Brewer, that I have ever booed, and I will help you out and tell you why. YOU RAPED MILWAUKEE. You were given a hefty salary, and you sucked...horribly. Now, I probably wouldn't have gotten on you just for that, though that is enough to justify the lack of love you got/get in Milwaukee. Had you maybe not shown up to spring training the next year looking like Val Kilmer ate Cold Stone and Jack In The Box daily, you would be given the benefit of the doubt. Too bad that isn't reality. It showed your lack of, not just self-control, but effort as a whole. That, Mr. Helms, is why you are rightfully booed and disliked in Milwaukee. I hope you live high off your game winning tater (go eat another one) and millions of dough (go eat some) the Crew gave away to you, because you'll soon be at Triple-A Albuquerque. That's where you belong. P.S. I heard they have great Mexican restaurants there. Lots of sour cream! - Dave Bush was sent to the minors to make room for Mike Cameron. I'm a little surprised he cleared waivers (he could have been pulled back if he was). It seems like if another team didn't put in a claim, a division rival might have just to block the move because the Brewers all but definitely would have pulled him back off waivers if he was claimed. Parra is still not real safe in the rotation. At this point, it seems like he wasn't sent down simply because he is a lefty. Parra had a nice game today, but only went 5 1/3. He hasn't got through the sixth inning yet this season. If Parra doesn't start going deeper in games, Bush may be back in the majors at his expense soon. More HERE. - Wes Helms pushed the Marlins over the Brewers today with a 10th inning home run. UGH. The Brewers lost the home series 1-2 to the Marlins. That was a disappointing series. The offense HAS to start clicking. - The Brewers lost two more extra-inning games this weekend. They have played eight extra-inning games already this season, almost a third of their games. - Sheets will pitch and Mike Cameron will join the Brewers in Chicago on Tuesday. This should provide a huge boost to the rotation (and by domino effect, the bullpen) and the offense. Hopefully the team can go on a roll and get some key wins against the Cubs. More HERE. - Torres has been productive from the bullpen, but isn't pleased with some of his results. I like to see players that aren't content, that are always looking to be better. - Jeff Weaver will join the Nashville Sounds rotation early in May. - Fielder is up to four home runs and has been much more productive at the plate. - Yost is not concerned with Weeks. Honestly, I've been more worried about Weeks awful throws to first than his bat. He has been hitting a lot of balls hard and the hits will start to fall. - Yost will shuffle the line-up a couple times a week to get Counsell, who has one of the hottest bats on the team, some playing time. This is an ominous sign. Hopefully the other bats heat up fast. - LaPorta is surging in AA after an early slow start. He now has six home runs and 22 RBI. - Josh Butler, who the Brewers acquired for Gabe Gross, pitched four scoreless innings for Brevard County this weekend. 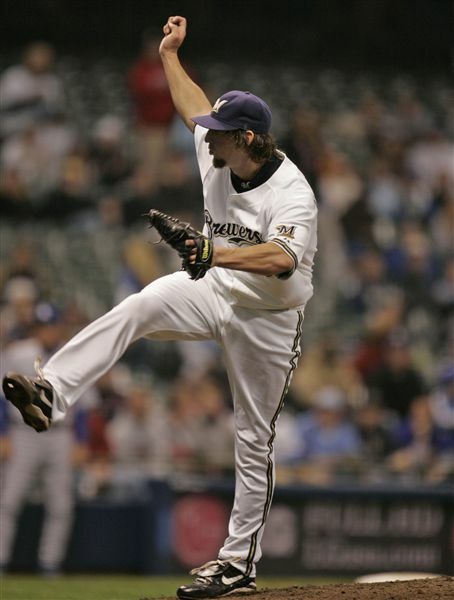 - The Junkball Blues analyzes Brewers pitching efficiencies. - Kendall in the nine spot is working, according to this analysis. - Baseball Digest Daily suggest the Brewers could make a "franchise-defining trade" by acquiring C.C. Sabathia and signing him to a long-term deal. Sure, if their franchise wanted to be defined as "over-paying in trade value and contract for an overweight, over-rated pitcher who has had one elite season." - Pitching! In 6 out of 7 games this week, Brewers pitching kept teams to 4 or less runs. - Russell "The Muscle" hitting .406 in Nashville. I still remember being at the game with the shot that bounced off the middle of the scoreboard. April must be bring back the awkward mustache month. Some players have been sporting new styles of facial hair. These styles are all retro and all strange. Prince Fielder - It looks like a Winston Zeddmore from Ghostbusters' mustache, but with massive chops. Some have said it looks more '70's adult films-esque or that he's trying for the Samuel L Jackson from Pulp Fiction look. Corey Hart - He shaved off the caveman beard and replaced it with a 'stache a la Brandon Flowers of the Killers, except that it's blond. Jason Kendall - His mustache, which may be best defined as caterpillar-like, is even more prominent without a matching beard. I truly believe he could be able to pull off the handlebar. When I find more pictures of Mustache Mania '08, I will update this post! In this the week of Geoff, I felt it was appropriate to provide a few tidbits on former Brewers still in baseball. I'll try to keep this up as items accumulate throughout the season. It'd be cool if others piled in items of their own as comments too. Here we go! -Gary Sheffield is considering retirement: In a fitting twist of karma, the 39-year-old has battled injuries all season. He is refusing surgery, so his options are running out. Gary, if you're reading this - please retire and stay as far as you can from baseball. -Gabe Gross made his debut with the Tampa Bay Rays Thursday: He went 0 for 3 with a walk and 4 LOB. I'm glad to see he'll be getting some regular playing time now. -Nationals reliever Ray King would sooner retire or demand a trade than accept a demotion to triple A: There have to be more than a few teams falling over themselves to covet a veteran lefty bullpen arm. Washington GM Jim Bowden seems to be a nearly impossible trading partner, otherwise I think a few low-level prospects would be enough to bring King back to Milwaukee to begin another brewery tour. -Oakland's Dana Eveland has be owning so far! Sent packing to Arizona en la Estrada-trada, and subsequently a piece in the Dan Haren deal - Eveland is making the most of his regular starting opportunity. He's posted a 2-1 record, 1.90 ERA and 18 Ks so far. He'll take the mound against Seattle tonight. Best of luck tonight, Dana. -The other part of the Estrada trade, Doug Davis, is recovering well from his surgical procedure to remove a cancerous thyroid. He's already taking batting practice. Great news. -In a reverse Jenkins moment, Wes Helms makes his minor radar blip of a return to Milwaukee for this weekend's Brewers/Marlins series. Once paid a fatty contract by Milwaukee to eat his way into a bench role - a sizable portion of Helms' deal was recently paid by the Phillies so another team would take him. I'll understand if fans forget to stand up and honor him and his Val Kilmer-on-a-cheesesteak-bender likeness during his token once a series plate appearance. -Johnny Estrada is probably still jogging out his first ground ball as a National. - The Brewers offense forgot to show up today. - Suppan pitched seven frames and only gave up one run. He has pitched well so far this season. - Riske gave up two runs after getting two outs in the eighth. He has not been pitching well and now has a 7.36 ERA. I'm guessing he'll get a day or two off as Maddux works with him to turn things around. - Braun and Hall each had three hits. Hopefully they both warm up. Braun has been hitting much better lately while Hall has been awful until today. - Jamie Moyer is the first lefty to start a game against the Brewers with his team winning this season. The Brewers are 6-1 against lefty starters. They beat Santana and lost with ancient Moyer on the hill... Ugh... It happens. They face another lefty Friday in Scott Olsen of the Marlins. - Piniella has sat Rich Hill for his start next week against the Brewers. He'll go with three righties. Hill has struggled and that undoubtedly played a part in this decision, but teams will do this more if the Brewers continue to roll up wins on lefties. - Counsell continues to play well off the bench. He got a pinch hit and raised his batting average to .355. - Sheets is preparing to return and a roster move will have to be made. Will Bush get sent down (if he clears waivers) or sent to the bullpen? One or the other seems very likely. - Eli at MLB Rumors says the word is that Braun and the Brewers are closing in on a deal quickly. With Tulowitzki and Longoria signing deals lately the two sides probably have a pretty good idea of what Braun's pre-free agency value is (at least right now). This is good news if it's true. - Alex Eisenberg at Hardball Times breaks down Gallardo. It looks good for Crew fans. Gallardo grades out very well in his system. It's an interesting read for sure if you have a few minutes. - Stetter has been a valuable part of the bullpen since his call-up. - Capuano has begun his rehab from his elbow injury. He'll have a long uphill battle to avoid Tommy John surgery. - More on Jenkins' return to Miller. And HERE. Is supporting every Bush unpopular these days? It seems like everyone with the last name Bush has a low approval rating these days. Being that this is a baseball blog, I'll leave the commander in chief to the wolves and instead stand in the corner of one of Milwaukee's least popular men at this moment: David Bush. With Ben Sheets set to return to the rotation Saturday, Dave Bush seems the likely man to garner some form of demotion - be it a long man role in the bullpen or outright trip to Nashville. I think there's a better idea... let's keep Dave Bush in the starting rotation. I will be the first to admit that Bush is having a wickedly harsh beginning to the season, with his ERA in the sixes, his walks up and "mistake" pitches a-plenty. But (and I might be the first person to ever say this) the season is long; the Brewers can afford to exercise a bit of patience with Bush. You may wonder what my desired shakedown would be then. To keep Bush getting regular big league innings to battle out of this funk, I propose the crew sends down current fifth starter (and my favorite player) Manny Parra, giving Bush the five spot and leaving Stetter (one of two lefties) in the pen. Manny pitched well in his first start of the season but has since struggled with walks and - arguably more importantly - to stay in games. With a reeling bullpen, I'd rather have a lefty on hand to get the Brewers out of jams than one that gets them into them. If Parra goes six or seven innings against St. Louis Tuesday, the bullpen options yesterday would have been greater; Stetter stepped in to pick up the prolonged slack both days. If you're going to base stats on who goes down, Parra's aren't much better than those of Bush. Plus Parra could use a bit more time in the minors to develop with all the innings he cares to eat. An injury is sure to happen and Parra will almost certainly step in to seamlessly fill any gap in the rotation (maybe keep him on Sheets' throwing schedule?). I like neither Bush nor Parra as long men because a long man isn't needed at this point. Seth McClung (out of options) and Guillermo Mota have shown they can man situations were shut down-type inning consumption is a must. It might not be a popular opinion, but in a "What have you done for me lately?" sort of era within an increasing impatient and wrongfully judgemental Brewers fan base - I think it's important to leave Dave Bush in a starting role. I'm curious to hear what others prefer Milwaukee does with Bush. We went to See-Off Geoff in proper style Wednesday. Everything went as planned - hell, BETTER than planned - as the Brewers won 5-4 and Jenkins acknowledged the throngs of thankful fans (even stepping out of the box in his first at bat) before going a splendid 0-3 with a walk. After today's hopeful 0-fer, best wishes Jenks. You'll always mean a lot to us. More HERE. -Prince mashed a pair of taters and Turnbow notched a rare save in Crew's win. The article also mentions the "fans" lack of patience and abundance of criticism with the team. I know there are high expectations for many this season but it's disgusting to hear so-called fans booing Bush and Turnbow for current or past struggles. Hey, Prince's diet conversation can maybe stop now too? - Prince is pretty much on pace with last year's HR barrage again after smacking two last night. -Little T is back in town. By way of Tuesday's Gabe Gross trade, Tony Gwynn Jr is back in the Milwaukee clubhouse. He walked in a pinch hit appearance Wednesday. -What a difference a year doesn't make?!?! Tom Haudricourt references similarities with last night's game and a game the same date in 2007. Prince homered twice and Turnbow recorded saves in both 5-4 wins. I'll take those outcomes any year. -People seem to like the Brewers. An ESPN (the?) Magazine poll ranks Brewers 13th in pro sports (No. 4 in MLB) in fan satisfaction. It makes mention to a 20 percent spike in attendance in 2007 and Miller Park's relative affordability. - The Brewers look to sweep the two-game series against the Phillies Thursday afternoon. - The Journal-Sentinel has a Brewers mailbag. -Reds fire GM Wayne Krivsky. And just when he was starting to get some things right! MLBTradrumors.com lists some notable Krivsky moves. You be the judge on whether his firing was justifiable. -Cubs win 10,000th game in franchise history. Note that many of those 10,000 victories came in a century that brought them exactly NO World Championships. - Another extra-inning game, this time a win. - Obviously Gagne's blown saves are becoming a big issue. He gave up a run today for his fourth blown save of the year (though the Brewers have amazingly only lost one of those games). Weeks should have turned a game-ending double play, but threw the ball in the dirt. No excuse for Gagne though. He shouldn't have made it that interesting. I don't see that happening yet, but it's of note that the rumors have already started. - The Brewers blew a five-run lead to allow the Cardinals to tie in the ninth. I would have lost a lot of sleep if the Crew didn't pull this one out. - The Gabe Kapler story continues to get better as he had the game-winning hit in the 12th. Was it Jungle Karma? He was on the Jim Rome Show on Monday. - Gabe Gross went two for four, had a key stolen base in the 12th and then scored the winning run before being traded to Tampa immediately after the game. Good luck Gabe. More HERE. - Manny Parra only pitched five innings, giving up three runs. He has not been stellar so far. Hopefully he works out of it. - The Brewers are going to be short on pitching tomorrow. Hopefully Bush can go deep into the game. Turnbow will be the only fresh arm out of the bullpen. - Speaking of Turnbow, Yost gave him a vote of confidence after his struggles Monday. - Weeks, Counsell, Braun, Fielder and Hart produced in the top five spots of the line-up, especially Braun, Fielder and Weeks. - Jenkins is coming back to Miller Park. Scroll down and check out all the RFB coverage of his return. Look for us tomorrow. We'll be in the right field bleachers in the first row of the loge level. Come say hey. - Prince's pace is starting to fall off his slow pace to start the season last year. He found his power stroke about this time last season. Hopefully history repeats itself. The Philadelphia Inquirer might have mocked RFB for doing See Off Ge-Off, but they can't really understand how we used to watch games. When an objective fan looks at Jenkins' stats, he probably sees a serviceable player. But when you put him around the likes of Chris Magruder, Jeff Liefer and Trent Durrington, he looks like Willie Mayes Jr. I remember watching games like they had only 4 innings. I lived and died with his 3-4 AB's, regarding them as the teams' "Only Chance." I often wonder how Geoff fared as well as he did, when teams knew he was the only guy in the lineup that could hurt them (on a regular basis). If he flew out to end the 8th inning - and the Brewers were down - it was a given that they could never come back. My favorite moment of Jenks is probably the second half of the 2005 season, where he turned around a shoddy start by slugging 16 taters and 53 RBI's with a .322 batting average. I will never forget that surge, and how he took the team on his back and brought us the Brewers' first non-losing season since 1992. I don't have a Jenkins' moment to talk about on this eve of his return to Milwaukee in another team's uniform so much as six moments that when put together illustrate how epic Jenkins' hot streaks could be. April 28, 2001 - Jenkins homered in his first three at-bats versus the Expos and had six RBIs in an 8-4 win. It was Ben Sheets' first win as a major-leaguer. "Man, if I ever did that," Brewers left-hander Ray King told ESPN after the five-home-run outburst, "I'd be going home and watching SportsCenter all day." Jenks only came a grand-slam short of the "homer cycle" since his three home runs were a solo shot, a two-run blast and a three run tater. He had a shot at the grand slam when he came up with the bases loaded for his final at-bat, but he struck out. The "homer cycle" has never actually happened in an MLB game. It's nice to not have to cheer for one player in seasons that the team flirts with 100 losses (or achieves the century mark), but it was Jenks that helped salvage something out of those awful years. It was easy to like Jenkins, even when he was cold, because he always played hard (even when his teammates didn't) and he loved the fans. Let's show him some appreciation tomorrow. Gabe Gross was traded to the Tampa Bay Devil Rays for pitching prospect Josh Butler minutes after scoring the winning run in the 12th inning against the Cardinals. Something had to give on the roster, as Gabe himself said. It hurts to lose a left-handed bat, especially one with power and the ability to take walks, on a team that is right-hand dominant, but in a way I'm happy for Gross. He never really took to the pinch-hitter off the bench role the Brewers used him in. He'd get hot when the Brewers gave him consistent at bats, but struggled otherwise. With the Rays, he should get a lot more playing time and may be a starter. I think he'll put up decent numbers too and it won't bother me at all. Gross only saw significant playing time this year after two injuries (Kapler and Gwynn Jr.) and with those players coming back and Mike Cameron about to return from his suspension, there would be even less playing time for him. Butler is an A-ball pitching prospect. He is 6' 5" and 200 pounds. A second round pick in the 2006 draft for the Rays, Butler was 0-2 with a 6.35 ERA in three starts at Class A Vero Beach this season. "Josh Butler is a big righty with a heavy sinker that generates tons of groundballs," Baseball Reference says. He appears to have some upside and is a recent early round draft pick so it's not a bad return. Some sites see him as a future reliever at least partially due to durability issues. Good luck Gabe. I know the RFB crew will miss the at-bat songs. ...it will be to see Geoff Jenkins in right field of Miller Park tomorrow evening. Jenkins was a staple in the Brewers outfield for ten seasons. He's remembered for his long bombs and his all-out, impressive defense. While he may not have been Robin Yount or Paul Molitor, he was the face of the Brewers for so long. Not only that, he was the lone bright spot for many years. As Tyler stated, Ge-off was, and is, a class act. A guy who never complained about being on a losing team. If fact, Jenkins loved Milwaukee and it's fans. He even bought a full-page spread in the Milwaukee Journal-Sentinel, after last season, to thank the fans. One memory that sticks out to me was a fantastic defense play Jenkins made to lock up a win against the evil New York Yankees a few seasons back. I don't know the exact date or many details, but it sticks out for two main reasons: 1) it was a perfect example of Geoff's all-out play and (should have won a Gold Glove) defense 2) it ended a winning performance against the hated Yankees. I hope you join is at Right Field Bleachers tomorrow evening to See Off Ge-Off. While Philadelphia fans and writers may not understand this, I believe it is important in showing Jenkins the love and respect Brewers' fans had and still have for him. I hope everyone in attendance will join us in thanking Geoff Jenkins for 10 memorable years. As I wait for today's game to start, I can't help but look ahead to Wednesday when the Phillies come to town and Geoff Jenkins, once the face of a reeling (dis)organization, will return to Miller Park in another team's uniform. Through his decade-long tenure in Brew Crew blue, Jenkins crafted a reputation as a team player who played hard every out of every game. Despite later adding freakishly different lefty/righty splits and epic slumps to said reputation, Jenks gave his all to the team he so loved, the only team he'd ever known - the Milwaukee Brewers until the club declined to pick up his option this season. All of us in RFB love Geoff. He's a class act who perfectly exemplified the work ethic and loyalty of the blue collar state he played in. Though I personally agree with management's decision to let Jenkins go when they did, I will remain forever grateful for what Geoff has done and how he's done it while a Brewer. As he comes to town a visitor for the first time, I would like to share one of the many memories that come to mind when I think of Geoff Jenkins. One heave from Mulholland's ancient arm and Jenkins broke the tie - and subsequently won the game - by blasting the first offering deep into the Brew City night, to eventually land somewhere in the upper deck in right as Jenkins' 10th homer of the season. Geoff would go on to hit 17 more homers and knock in 52 more runs that season, both team leading totals (27 and 93, for those of you scoring at home). The Brewers would lose the following day's game against the eventual AL Central-champ 2004 Twins... and 63 more games after. But I'll always remember that once pitch at bat that proved the decisive factor in giving a bad '04 Brewers club one of its 67 wins. And that was Jenkins - the jewel in a crown of thorns that were many Milwaukee seasons in the past decade. - The Brewers lost another 4-3 game. This one wasn't quite as heart-breaking, but it still sucked. - I'm not on the criticizing-Yost-for-every-decision-that-looks-questionable-in-hindsight bandwagon, but why did he bring Turnbow into a tie game in the ninth inning? Riske was available. Torres was probably available. Mota could have went another inning. Turnbow has not been able to pitch scoreless innings all season. I just don't see why he would be the go-to guy in this situation. Needless to say, he gave up the winning run. He has appeared five times this year and has allowed at least one run in three of those appearances. He has given up at least one hit or walk in each of those appearances. How about you give him a couple meaningless innings to see if he can find some kind of consistency before trotting him out in the ninth inning of a tied game against a division rival? - Villanueva pitched seven solid innings, giving up two runs. - Hart had a rough night. He went one for four with a gift triple (it was a pop fly that Ludwick lost in the lights), committed a costly error that allowed the Cardinals to go ahead in the eighth and missed a ball he should have caught to the end the third inning that ended up hitting against the outfield wall, scoring two. The play in the third inning was tough, but definitely catchable, especially for Hart, who is usually very solid in the field. - Hart's "triple" was the team's first of the season. They were the last MLB team to get their first triple. - Braun smashed two doubles today and came a couple feet away from hitting a moon shot home run in the first. He looked like he was swinging the bat well. - Hardy and Hall looked terrible tonight and went a combined 0-9. - The Brewers will skip Sheets' next start as he recovers from a strained right triceps. Sheets says he could have gone Wednesday when he was scheduled to start, but the Brewers are being cautious since it's early and he has an injury history. He'll return Tuesday, April 29 against the Cubs. More HERE. - Sheets is leading the NL in opponent batting average against at .146. Let's hope he is 100 percent after this rest and can keep up his stellar start to the season. - Gagne promised Yost he would have the grounds crew fix the mound the next time he struggles on a slippery mound. Is that his excuse? Apparently. Again, it really didn't look like he was pitching all that bad until he walked the batter following the two home runs. It was his first loss of the year and the first of his three blown saves that cost the Brewers a win. He is second in the NL in saves. Let's not get crazy. He'll be fine. - Cameron will begin a five-game stint with the Sounds on Thursday in preparation for his return to the line-up on April 29, the same day Sheets is slotted to return to the rotation. - The Brewers face four lefties in a row after facing Kyle Lohse on Tuesday (unless teams change starters). That should bode well for the cold hitting the right-hand-dominant Brewers have been experiencing. - Outfielder Laynce Nix was batting .306 (19-for-62) with three homers and 12 RBI for Nashville going into today. He's still probably a long ways away from being on the big-league squad with the roster pinch the Brewers are dealing with right now, but it's still nice to see Nix (or any other Brewers minor-leaguer) hitting well. - JSOnline Brewers beat reporters answer fans' questions in a mailbag column. - Suppan continues his outstanding community work. More HERE. - Dave Lubach provides some reasons to be positive about the Brewers' season so far. - Mark Mulder is getting closer to returning to the Cardinals rotation. - The Reds called up Jerry Hairston Jr. and designated Juan Castro for assignment. - Former Brewer Jorge De La Rosa was named the Pacific Coast League Pitcher of the Week for last week. De La Rosa has better "stuff" than anyone on the Brewers, but always struggled with location. If he was ever able to put it all together, he'd be a great pitcher. I thought he'd stick in the Royals rotation and work out his location problems, but he's down in the minors now. Maybe we'll see him back up soon if he keeps pitching like he did last week though. - Gagne gave up three runs to blow the Brewers' two-run lead in the 10th and lose the game. Honestly, the two pitches that went for home runs didn't look that bad. The hitters (including Paul freakin' Bako) just took good swings. Gagne has looked very solid in most of his outings this year after his first. It's too bad he blew this one. It was a tough game to lose, but I still feel good about a winning road trip. - Gallardo's return to the rotation was very encouraging as he went seven innings and only gave up one run. - J.J. Hardy is six for his last 15. Hopefully he's getting hot. - Ben Sheets is feeling tightness in his right triceps muscle. He left his start early on Friday. No matter how minor an injury may sound, you always worry with Sheets. It sounds like he has progressed OK over the last couple of days and may just get pushed back a day or two for his next start. Hopefully it's nothing too serious, but it's definitely something to keep a close eye on, especially since the Brewers need a healthy Sheets and he has started the season so well. - The Brewers won 5-2 on Friday in Sheets' start. - Braun Q&A with ESPN's Jonah Keri. - Hall and Hart have switched places in the batting order with Hart moving up to five and Hall down to six. I don't think this will have any kind of huge effect on either player. - The Brewers are looking forward to coming home after their nine-game, 10-day road trip. - Gwynn Jr. began his rehab stint at Nashville. He could join the Brewers again soon since the team is carrying 14 pitchers at the moment. - Joe Dillon was optioned to AAA to make room for Gallardo. Dillon was not receiving a lot of playing time off the bench. He'll likely be back in Milwaukee at some point this year. - Mitch Stetter provides some relief to the bullpen, which has been pitching a lot of innings. With 14 pitchers for the time being, the pen should get a little rest, specifically Shouse, who was getting a lot of work as the only lefty. - The bullpen took their first loss of the year today. Milwaukee relief pitchers are now 5-1. - Suppan pitched well and Hall was clutch in the Saturday win. The Brewers beat the Reds with Cueto pitching. - Is Braun in a sophomore slump? - OnMilwaukee.com interviewed Brewers director of grounds Gary Vanden Berg. - Paul Bako and Ryan Freel getting tossed for arguing for the exact opposite thing. Bako got tossed arguing that a pitch was a strike, Freel getting tossed for arguing a pitch WASN'T a strike. - It's hard to say the Brewers needed a win this early, but they were really in a funk and a come-from-behind, extra-inning road game against a division foe could go a long way towards getting the team on the right track. Even though it was a three-run lead for the Cardinals, it felt like they were up by a dozen. The Brewers did next to nothing against Lohse most of the day. Good win. - Prince hit a home run! And I'm sure there are many more to come. I love how excited he was about it. He's like a big kid. It's fun to watch him when he's going well. I hope he gets hot. - Parra struggled for the second straight outing. He only lasted four innings. Yost haters: Mark down a big A+ for Yost's management in this game. If he hadn't pulled Parra when he did, the Brewers very likely would not have won this game. - The bullpen pitched great behind Parra. McClung pitched three scoreless innings followed by scoreless appearances by Mota, Shouse and Gagne. - McClung's good performance, Parra's mediocre outing, and Villanueva's less-than-stellar start yesterday are probably making the pending roster decision tougher on Brewers' management. Someone has to go in the next day or two to make room for Gallardo. - Lefty reliever Mitch Stetter has been called up with infielder Hernan Irabarren getting sent back to Nashville. They want to try to watch the workload of Shouse, who has been stellar so far this season. - Gwynn Jr. was sent to Nashville for a rehab assignment. He could be ready to come back up by the weekend. - Kapler had a pinch at-bat in the game today and appears to be close to ready to get significant playing time again. - More details on the Weaver contract came out today. He'll get $12,000 a month to pitch for Nashville and $1.25 if he's called up to Milwaukee. He can earn $2.75 million in incentives: $100,000 bonuses for 25, 35, 45, 55 and 65 innings; $250,000 bonuses for 75 innings and each additional 10 innings through 135 innings. - John Sickels at MinorLeagueBall.com profiles Villanueva in his Not a Rookie series. He doesn't see much upside for Carlos. - It's Sheets vs. Arroyo in game one of the Reds series at Cincinnati tomorrow. I like that match-up. - Another Baseball Blog provides in-depth analysis of Sheets' last start. - Ken Rosenthal has a nice story on Gabe Kapler's return to MLB. - The St. Louis Post-Dispatch did a story on Fielder and Braun's hitting struggles. - Tejada is two years older than he said he was. He's actually 33, not 31. He'll turn 34 this season. So, the Astros have found out Tejada was on the Mitchell Report, was being investigated for lying under oath, and is actually two years older than he said he was all since they traded for him. Still, his production has been very good so far this year. - Cubs fans threw at least a dozen baseballs onto the field after Adam Dunn hit a home run in yesterday's game. At least eight of those fans were ejected. I'm glad to hear the Cubs cracked down on this. That could have turned into a really, really obnoxious tradition, even more than the original throwing the ball on the field tradition. NOTE: Brewers fans, throwing home runs onto the field is a freaking Cubs' tradition. Please do not throw home run balls back on the field at Miller Park or encourage others to do so. Thank you. - Chris Carpenter through a 60-pitch session in his rehab campaign. He's hoping to come back in late June or early July and could be a huge boost to the Cardinals. I expect the Cardinals to be firmly behind the Cubs and the Brewers and probably the Reds too by that point though. Their pitching simply can't hold up like it has so far. Chalk one up for Prince . Today's 10th-inning Fielder soy bomb proved the deciding factor in Milwaukee's 5-3 Brewers win. He looked happy to get that elusive first one off his shoulders. I think with number one in the books, many more are to follow... not 50 more, but enough to keep fans happy and runs on the board. In other news, 2B/OF Hernan Irribarren - whose RBI today helped bring the game to extra frames - was sent back down to Nashville to make way for Mitch Stetter. This was by no means a shot at Irribarren (who's played quite well in limited time). With Shouse getting considerable work in the pen, another lefty is warranted. Gwynn is rehabbing for the time being and Gallardo is on the cusp of returning to the rotation, so the Stetter promotion doesn't look to be too permanant... unless Melvin found a suitor for Turnbow, which I doubt. Though it's hard to be excited about taking one of three, the Cardinals are the division leader and it beats the alternative of dropping all three - which almost happened.